Yogurt drink with L.Casei Danone cultures, vitamins B5, B6, D and guarana. No added sugar - contains naturally occuring sugars. 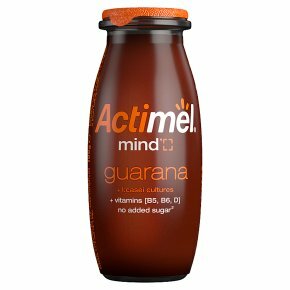 Mind1 Guarana is the plant from the Amazon basin known for its naturally caffeinated seeds, which we blend smoothly with delicious yogurt containing billions of L.Casei cultures. We also add 1vitamin B5 to support normal mental performance. A shot bursting with roasted flavour to wake up your taste buds. High caffeine content. Not recommended for children under the age of 10, pregnant or breast-feeding women.